It seems my old history teacher was right when he tried to warn me that time would run when I was like him, in his early fifties. Now after twenty months on Twitter I have to concede to him that “time” would now be best described as flying! In one of those staring blankly out of the window at the sun rising moments it occurred to me that during that twenty months we had done quite a bit, met quite a few people and made quite a bit of money! So to make list’s of the numbers I had to go back to the beginning. Once set up on Tweetdeck we set to work following our choice of interesting people and the companies we wanted to learn more about and hoped to meet. Strangely, we did not think followers were important so were not counting seriously, but before long we were at six hundred but only really paying attention to interesting people who talked to us or answered our questions. After a hard day, instead of going to the pub and spending too much money, it was a pleasure to come home and have a glass of wine while chatting to others, exchanging friendly banter. Discussing work often came up and lead to more private DMs or phone conversation. Then the facts were pointed out to me by Mike that we had turned over twice as much as the previous twenty months before Twitter. An additional, very large amount by working with individuals and companies that we had found through “social media” – a description that seems a bit vacuous and lame for such a powerful tool, and one upon which I am far from keen. Are there amazing people on Twitter? Yes, there are plenty of them. Some highly talented writers, interior designers, architects, photographers, landlords and even lovely estate agents!. From many of these businesses we have followed up leads and made several solid new friends. I’m not sure now if we started Twitter with the idea of getting more business or meeting such interesting people, it all sort of blurs together in to what I think is best described as a rainbow with a pot of gold somewhere along the way! On a crisp, sunny morning walking through Southwark in south London, we were en route to meet another architect, managing a project for someone else we met on Twitter; we chatted about the fact that not once had we spent any money on publicity yet were constantly being called and emailed with enquiries to help specify, design or supply kitchens and bathrooms. This work has enabled Fonte to keep going through some of the darkest days of the economic downturn; yes, we have had to move to smaller premises due to monumental rate increases but many of our suppliers and competitors are sadly calling it a day, giving up the hype that business is booming for the truth that no one is spending any money at the moment and life was tough! Fortunately, Mike and I resisted temptation to expand with outside investment because it meant relinquishing control. Now, on reflection, it may have ended in tears as tough times cause many people to lose their nerve and want out, which would have forced us into selling or being landed with a new, unknown partner. Being a small company with many contacts and capabilities, we can adapt and service customers of all shapes and sizes. We currently have a hotel project in Central London, several bathrooms in private residential houses going on, wetrooms we have helped to design, supply and install, from the drawings through to tiles to brassware and sanitary ware. Where required we will call in our own people to fit glass or tiles and install plumbing to a high standard. Interestingly, Twitter seems to bring a large amount of middle -to-high end projects; clients undertaking this work are very often from professional, experienced backgrounds and expect a high quality product so understand that they are going to cost more. From time to time we meet clients who want it all for very little money, not understanding exactly what quality and design entails. Interestingly not many, if any, from Twitter! Affordable but surprisingly expensive looking! that seems to be what everyone wants during economic hard times and that’s what we aim at. Get the budget right and deliver above expectations and you will keep your client. Laufen bathrooms have been a big part of Fonte dei Marmi for a few years as we sell and specify their bathrooms. 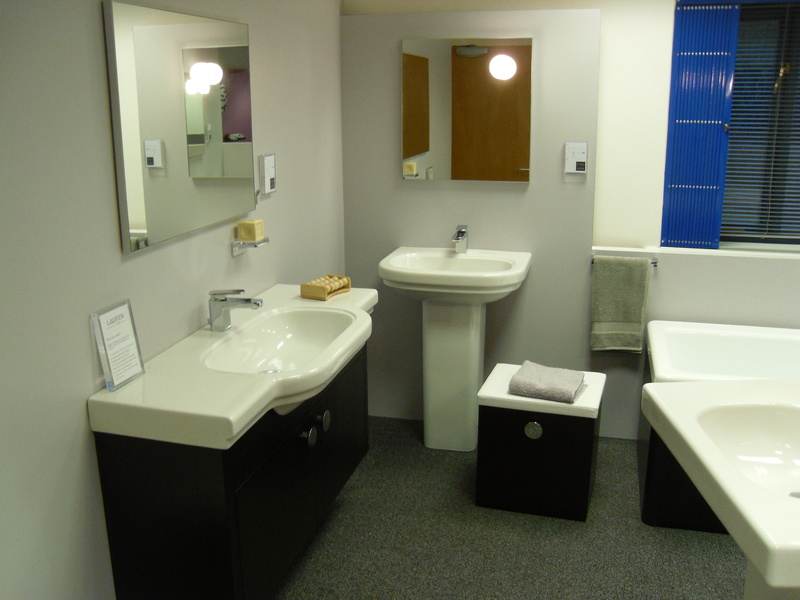 Laufen have been one of the best companies manufacturing high quality affordable bathrooms that we have worked with. So when it came to an idea to bring Twitter in closer to our suppliers the choice was swiftly made. Working with the UK directors & sales directors – and great respect to them for listening to us banging on about Twitter – we were able to organise a really succesful tweetup in Evesham at Laufen’s UK headquarters. Pri vileged to enjoy an evening with twelve guests from a list of many we wanted to invite. We planned to bring our guests from Twitter to a hotel and have dinner together with Laufen, then spend a good part of the following day at their showroom to explain their products and get across the story of our suppliers development, as Laufen is a Swiss company the event was called Swissness! The evening was spent in the hotel bar and restaurant over drinks and dinner. While we enjoyed meeting everyone it was also really nice to see all the networking energy going around, it was obvious these people would all become friends or most likely do business in the future. I saw this as an investment in our future and that any business that was linked to the bigger picture would pay dividends sooner or later for Fonte dei Marmi. This all came from an idea to invite some of Twitters finest along to see Laufen’s UK showroom in the Cotswolds near Evesham. The list of our guests was impressive: many successful interior designers & property developers joined us for the two days. The second day we spent at the Laufen showroom with Andy Jameson and Russell Barnes; old friends of Fonte dei Marmi who between them explained the Swissness of Laufen to our Twitter guests. The feedback and blogs written was an unexpected bonus, many professional writers posting their account in many different ways of the time spent with us in Evesham. Twitter is a useful tool but there are ways to use it carefully. We would advise using it to get to know professionals in whatever service or business you are involved. In the next part we will go in to more detail about who’s who amongst our Twitter friends and what they do that makes them successful, but that will just be the tip of the iceberg!, Mike and I have many stories to tell, and as long as our friends are OK with it, we will write it. For now, think about this wonderful way of cutting through layers of research and advertising to find your clients for free! If anyone knows how to use Twitter to it’s best then it’s you Tony – well done. Great blog and glad you have survived harsh times to be able to share your experience and story. Hope business keeps growing and that one day we will work together. Best wishes to you both. Look forward to working with you soon Ana, hoping that a project we can help you with comes along soon. Meanwhile we are following you and I’m sure Twitter will work it’s magic for you, growing your business in the way we have seen it with us. thanks for reading the blog and making time to comment-Tony. You guys are great ambassadors, great friends and great at getting people together, whether it be for business or socially.